FREEDOM TO SLEEP ANYWHERE. Designed to fit today’s active lifestyle, Transcend and its revolutionary technology offer the first radical advancement since CPAPs were invented. Transcend gives you freedom you’ve only dreamed of in sleep therapy - freedom from stress, freedom of unlimited movement, and freedom to sleep anywhere you chose. Transcend is the smallest, lightest, most portable and most practical sleep apnea therapy system available. It is perfect for traveling, whether you’re driving over the road, flying off to your next business meeting, or taking that well-deserved vacation. 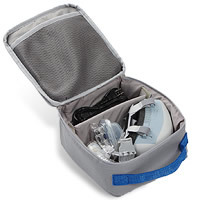 The Transcend CPAP is approved for use on commercial airlines by the FAA. Click here to read the Transcend FAA Compliance Letter (PDF). Worn on the head, Transcend is quiet and vibration-free. The short hose and compact interface help prevent seal leaks and provide unlimited mobility. With Transcend, you’re free to roll over in bed  or even get up and walk around - when using the optional battery  without breaking the mask seal, disconnecting a hose, or sacrificing therapy. Transcend’s heat moisture exchange technology, which is clinically proven in hospitals, provides warm, moist air to help you sleep comfortably without the aggravation of a water-filled humidifier. And because Transcend is compatible with the most popular mask seals on the market, there’s no need to break in a new mask. Therapy compliance monitoring is a breeze too. Simply connect Transcend to your computer to download compliance data that can be emailed directly to your care provider. Never before has sleep apnea therapy been this easy or fit your lifestyle so completely. With Transcend you have the freedom to sleep anywhere. Compact, Portable and Perfect for Home & Travel - Transcend is not carry-on baggage. It fits into your carry-on bag! Weighing less than 1 lb, Transcend is small, lightweight, and incredibly portable. Its universal AC power supply powers Transcend anywhere in the world, and pressure automatically adjusts to altitudes up to 8,000 feet. Sleep Apnea Therapy System You Wear - Transcend fits comfortably on your head. Its quiet, vibration-free design together with its adjustable headgear makes it comfortable and stable so you and Transcend move together. Once you lie down Transcend rests on the pillow and you hardly know it’s there! Hassle-Free Humidification - Transcend is the first sleep apnea therapy device to use HME (heat moisture exchanger) technology. Instead of a humidification chamber, the Transcend HME captures warm moisture from exhaled air and gives it back to you as you breathe. Regularly used in hospitals, the HME is small, hygienic, and disposable. No more hassles with heated water chambers. No more spilled distilled water. No more cleaning messy reservoirs. NOTE: The Transcend CAN be used without an HME in place if patients prefer no humidification. Freedom From a Six-Foot Hose - The Transcend hose is shortinches rather than feet from mask to blower. This helps minimize leaks caused by the hose pulling the mask as you roll over in bed and maximizes freedom of movement. Because you are not tethered to your bed stand, Transcend even lets you rise during the night (when using the optional Transcend battery) without removing the device, breaking the mask seal, disconnecting a hose, or disrupting therapy. Low Power and Battery-Operated - Transcend can be powered by an optional mobile power adapter that plugs into a standard DC power supply without fear of draining your vehicle’s battery. 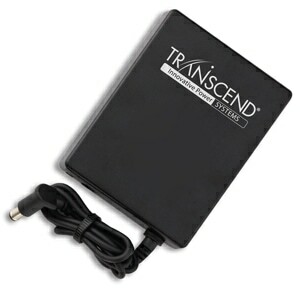 Transcend even delivers therapy if there’s no power, if the power goes out, or if you just don’t want to plug it in. An optional, rechargeable battery pack will give you a full night of restorative sleep anytime, anywhere. Easy to Maintain and Clean - Transcend is easy to maintain and has few parts to clean. The hygienic HME is disposable and the system has a dry mode feature to keep the device dry. LED lights alert you when it’s time to clean the air inlet filter, and the interface and headgear are cleaned with mild soap and water. 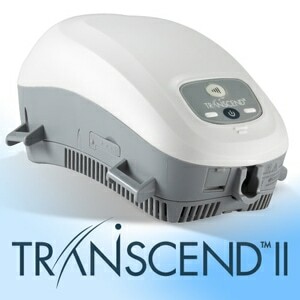 Full Range of Sleep Apnea Therapy - Transcend has all of the features you rely on in a sleep apnea therapy system. It is compatible with most popular nasal seals, provides a full range of therapy pressure, tightly regulates air flow, and includes a ramp feature. Plus, the hygienic Transcend HME provides warm, moist air to keep your mouth and nose from drying out. Simple Compliance Reporting - Transcend’s memory chip stores 13 months of compliance data that can easily be downloaded using the built in data card or a USB connector for data transfer. Proprietary software lets you email compliance data directly to your healthcare provider. Optional Battery Packs - Sleeping under the stars? Transcend also delivers your therapy if there’s no power, if the power goes out, or if you just don’t want to plug it in. An optional, rechargeable battery pack will give you a full night of restorative sleep anytime, anywhere. And, if you are using Transcend on the road, the battery pack is easily recharged using your vehicle’s DC power outlet. Transcend is compatible with the most popular nasal seals on the market today. To date the following nasal seals can be used with Transcend: Resmed Ultra Mirage II, Resmed Mirage Activa, Resmed Activa LT Series, Respironics ComfortGel (Original) Nasal, Respironics ComfortGel Blue. Transcend's unique Mask Shell & Adapter Interface allows you to use any of the mask cushions/seals listed above with your Transcend CPAP. Each Transcend comes with one adapter ring (select your preferred size and style at checkout). Additional nasal seal options are being added to this list as they become compatible. If you don’t see your preferred nasal seal above, ask your dealer about it.